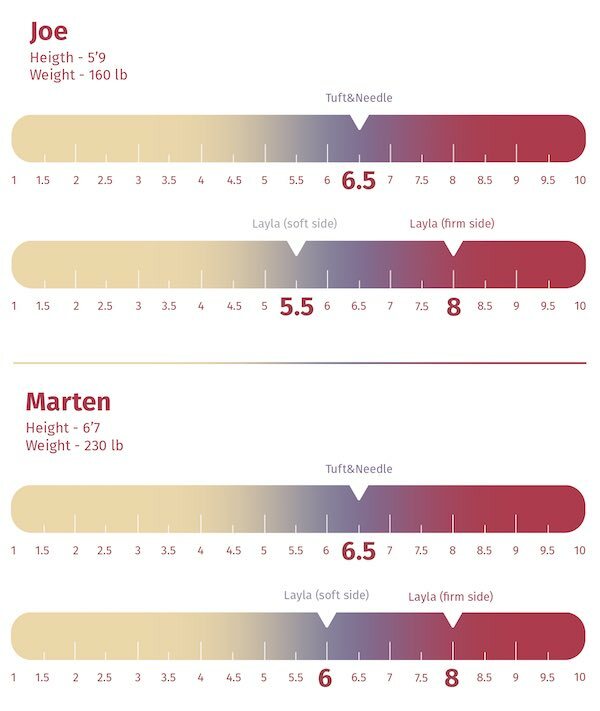 Layla Vs Tuft And Needle Mattress Comparison - Which Will You Choose? Home » Layla Vs Tuft And Needle Mattress Comparison – Which Will You Choose? Layla Vs Tuft And Needle Mattress Comparison – Which Will You Choose? If you are deciding between the Layla and Tuft & Needle mattresses, you are already in a good position. You have narrowed down your search to two great all-foam mattresses. I have broken these mattresses down based on their construction and which mattress will be a better fit for different types of sleepers. Which mattress will be best for you? Read on for my full comparison. They are both popular mattresses. They both have great customer service terms. They are similar in terms of thickness. They have a similar base layer. The Layla is more expensive than the Tuft & Needle. The Layla has a more complex design. They incorporate some different materials in their construction. The Tuft & Needle is firmer than the soft side of the Layla and softer than the firm side of the Layla. The Layla has a classic memory foam feel, and the Tuft & Needle has a balanced foam feel. The Layla is 10” tall. The cover is infused with Thermogel to help with cooling. 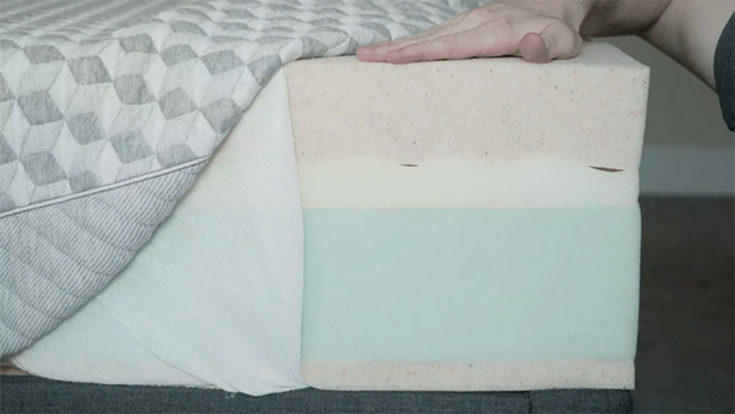 From the soft side down, first, there are 3” of a copper-infused memory foam. Next, there are 2” of a convoluted support foam. It has channels to help with airflow. The support layer is 4.5” of a 2 lb. base foam. On the firm side, there is 1” of copper-infused memory foam. The Tuft & Needle is 10” tall. The first layer is 3” of an Adaptive Foam. 7” of standard base polyfoam makes up the base. The Tuft & Needle incorporates a proprietary Adaptive Foam in its top layer. This foam is pressure relieving and responsive. You should feel comfortable without getting stuck. The Layla has a more complex design than the Tuft & Needle. It has a thin layer of copper-infused memory foam on the firm side and a thick layer on the soft side. You can flip the mattress depending on what position you sleep in. The Layla’s soft copper-infused memory foam makes it so you sleep in the mattress, especially on the soft side. 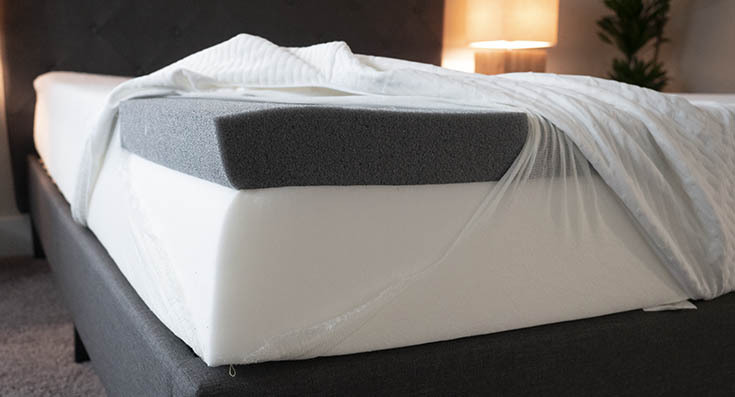 The responsive Adaptive Foam makes it so you sleep on top of the Tuft & Needle. Both mattresses should be about the same in terms of durability. The Tuft & Needle should be the more breathable mattress, so you should have less trouble sleeping hot. On the soft side, the Layla feels like a 5.5/10 in terms of firmness. On the firm side, it feels like an 8/10. The Tuft & Needle is right in between these two numbers and is closer to a 6.5/10. Back sleeping on the soft side of the Layla, I feel decently supported. That being said, I would not choose this side of the mattress if you only sleep on your back. Also, the firm side might be too firm if you sleep on your back. I feel the best side sleeping on the soft side of the Layla. I really sink into that soft copper-infused memory foam. There is barely any pressure on my shoulders and hips. When I am on my stomach, the soft side of the Layla does not give me enough support. The firm side would be better if you sleep primarily on your stomach. On the Tuft & Needle, I feel great when I am on my back. I feel better support on this mattress, so I feel less like I am falling into the mattress. However, I don’t feel the pressure relief I felt on the soft side of the Layla. The Tuft & Needle is a decent match, but I would choose the Layla if you are a side sleeper. Like the soft side of the Layla, the Tuft & Needle is too soft for me when I am on my stomach. The Layla has a classic memory foam feel. Lying on the mattress, I slowly sink in, and it feels like I am sleeping in the mattress. There is very little bounce, so it might be more difficult to move around on this mattress. The Tuft & Needle has more of a balanced foam feel. The Adaptive Foam is soft but responsive I feel nice pressure relief, but I never fell stuck. Overall, it feels like I am sleeping on top of the mattress. See what I thought of Layla’s classic memory foam feel in the video below. Now, watch what I thought of Tuft & Needle’s balanced foam feel. Memory foam is often a great choice when motion transfer is concerned. This material does a very good job of isolating motion so that it does not transfer from one side of the mattress to the other. So, I am not surprised that the soft side of the Layla handles motion transfer better than the Tuft & Needle. This side of the Layla has a thick layer of soft memory foam, and it cuts down on motion transfer very well. If you sleep with a partner, Layla is the way to go. It is the better mattress for couples. See how well the Layla handles motion transfer in the video below. Compare this to Tuft & Needle mattress. See that the Adaptive Foam is not quite as effective at dealing with motion transfer. I did not feel secure sitting near the edge of either mattress. Both mattresses collapsed quite a bit when I sat down. Also, lying down near the edge of both mattresses, I did have that feeling that I might roll off or be ejected from the mattress. While the Layla is a bit better when it comes to edge support, this is not a highlight of these two mattresses. I said the Layla was a 6/10 on the soft side and an 8/10 on the firm side. The Tuft & Needle felt like a 6.5/10. When I’m on my back on the Layla, I’m not getting quite enough support on my lumbar area. I’m falling into the mattress a little bit. On my side, I feel good pressure relief on my shoulders and hips. When I’m on my stomach, I feel my hips sink in too far, so I’m getting out of alignment. On the Tuft & Needle, I”m not getting enough support when I am on my back. I feel good pressure relief when I am on my side. Also, when I lie on my stomach, I need more support. If you are a heavier back sleeper, both mattresses are probably too soft for you. If you are a heavier side sleeper, both mattresses could work. If you are a stomach sleeper, neither mattress will probably be firm enough for you. You might want to look at the firm side of the Layla or a firmer mattress overall. If you are a heavier person like Marten and sleep on your back, both these mattresses might be too soft for you. At the same time, the firm side of the Layla will most likely be too firm. However, the firm side of the Layla could work if you are a heavier stomach sleeper. It appears that both of these mattresses could work for a side sleeper of Marten’s size. However, I will warn you that, if you are even larger, you may press further into these mattresses and feel some more pressure on your shoulders and hips. You prefer a soft mattress. Between the two mattresses, the soft side of the Layla is definitely softer. If you like a little more give in your mattress and want some extra comfort, the Layla should be the way to go. You are a side sleeper. The Layla is a softer mattress, and it should be the better choice for side sleepers. I felt better pressure relief on this mattress than I did on the Tuft & Needle. You like a memory foam feel. If you like to slowly sink into your mattress, the Layla should work for you. It has that slow-moving quicksand feel, so if you prefer to sleep in your mattress, choose the Layla. You prefer a medium-firm mattress. This mattress is right down the middle in terms of firmness. If you like a balance of comfort and support, the Tuft & Needle could work for you. You are a back sleeper. The Tuft & Needle is the firmer of these two mattresses. If you sleep primarily on your back, you should get better support on this mattress. You like a balanced foam feel. Between these two mattresses, the Tuft & Needle has more of a balanced foam feel. It feels more like you are sleeping on top of the mattress rather than sleeping in it. If you consider the information above, the choice between Layla and Tuft & Needle should be an easy one. The Layla is a great choice if you like memory foam and sleep on your side. If you sleep on your back and prefer to sleep on top of your mattress, the Tuft & Needle is a better choice. Please leave any specific comments or questions about the Tuft & Needle or the Puffy in the comment section below.